We have a tendency to rush the seasons and the 4th of July often feels like summer’s half-way point. But since we are only 36 days into summer, that’s just crazy thinking! With so many activities going on in Marion County throughout the month, you can see that there is still a lot of summer left in well, summer! Grilling season is upon us, but how did colonial settlers cook? Join reenactors at the fort for Hearth Cooking demos every Tuesday. Colonial kids’ games (Aug. 2 and 9) make history intriguing for young folks, too. There’s also the Blacksmithing Workshop from Aug. 25-27. Forge your own handiwork, just as settlers did centuries ago! County. 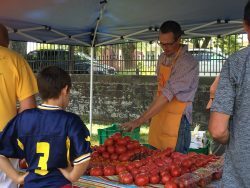 Stock up on vine-ripe berries, vegetables, and fruit every Tuesday (4-6 p.m.) and Saturday (9-11 a.m.) at Veteran’s Square Plaza. Honey and baked goods will be available as well. Know your ketchup? You definitely will after the 9th annual Tomato Festival on Aug. 20. Sample dozens of juicy varieties, watch food demos, grab some lunch, and enjoy summer to the fullest, all at East Marion Park. It’s late summer. Make those carefree days last with trips to the Mannington District Fair! From Aug. 7-12, savor circus acts, carnival rides, animal shows, live music, and sweet treats. Arts Afire will light up your night with stunning circus acts. You’ve never seen flames like this before! Catch the show at Palatine Park on Aug. 19. Also coming to town: Monongah’s Monongahfest. Kids’ games, fireworks, vendors, and a duck race are just some of the highlights. Come early Aug. 19 for a town hall breakfast! Venture over to Palatine Park on Aug. 5 for some aquatic acrobatics! Since 1997, the Chippewa Lake Waterski Show Team has performed stunts, ballet, slalom, and tricks around the midwest. Now they’ll give the Monongahela River at try. And after that, hang around for Fiesta Latina! 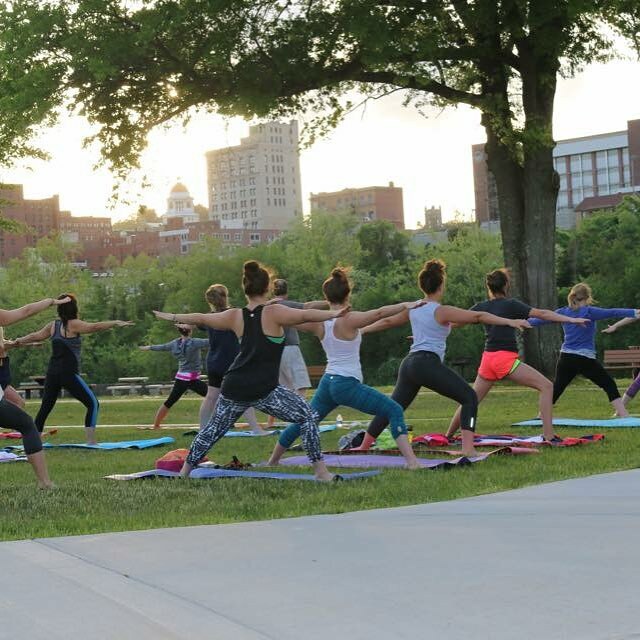 Palatine Park will also have yoga on Aug. 7. While calming music plays under a full moon, unwind with essential oils and mat exercises. How’s your aim? The WV Cup Disc Golf Tournament comes to Seth Burton Memorial Disc Golf Complex from Aug. 12-13. Register and get a player pack and lunch, or watch folks compete for top honors. Get ready for giggles Aug. 25 at the Frank and Jane Gabor WV Folklife Center in Fairmont. Tales of 3 Liars is a hilarious storytelling event for anybody with a funny bone— even the kids. Keep plowing through that week! The Fairmont First Friday Concert on Aug. 4 brings bands and family entertainment to Veteran’s Square Plaza. Pricketts Fort will have 2 acts this month: Black Horse, a honky tonk band (Aug. 4) and Jason Hall, a classic hits duo (Aug. 11). Palatine Park in Fairmont will have free music on Aug. 11 with the Mark Tucker Band. Classic rock will play from 6-11 p.m., so pack a dinner and bring a blanket. Crave some country tunes? The Hamilton Round Barn in Mannington will have its Back Roads and BBQ bluegrass dinner on Aug. 26. The Sagebrush Round-Up in Fairmont also has live shows and home-cooked meals every Saturday. Even adults will appreciate this animated movie, which has its humorous side. Expect the show to last from 8:45-11:30 p.m.
Save the date! The Seth Burton Memorial Disc Golf tournament is coming Sept. 9-10. Multiple divisions for players of all ages and abilities. Entry fee includes lunch. So no complaints about being bored! Which August events are you most excited about?